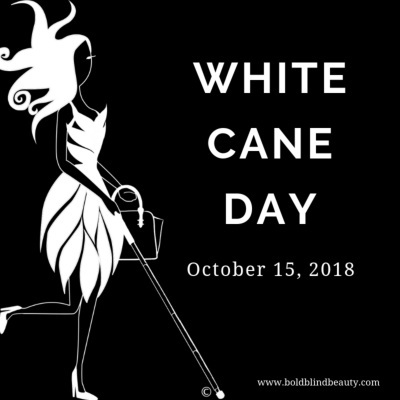 White Cane Day celebrates the achievements of blind and visually impaired (B&VI) on October 15 every year. It also reminds people of how the white cane is an important tool in helping the B&VI live with greater independence. We are extraordinary. We are able to see the world through a spectrum few get to experience. No matter where we fall on the blindness range we have developed skills from self-care to independent living that allow us to take full advantage of our remaining sensory systems. Among our ranks are poets, ballerinas, teachers, composers, models, pianists, writers, singers, social workers, psychologists, photographers, artists, fashion designers, lawyers, physicians, athletes, chefs, yoga instructors, astrophysicists, chefs, and the list goes on. We chose to soar and continue to thrive beyond physical limitations because we understand there is always a way. Bold Blind Beauty template with fashion icon Abby to the left of the text. Abby is walking with her white cane in one hand and handbag in the other. The image and text are white with a black background. She wears a stylish dress and heels and is sporting her signature explosive hairstyle. Nicely said, Steph. Thank you. This is a special day in that it offers a chance to tell the world about positive things. Likewise, it offers a reminder of self-worth and that no one is alone.